When faced with the research of a Jewish ancestor it may seem a daunting task. We think of the Holocaust and the incredible destruction of lives, synagogues, and cemeteries in Europe and wonder, why should I even try? Then there is the myth that immigrants had their names changed at Ellis Island and so our Jewish ancestors are nearly impossible to research. All of these things scare off many Jews from researching their family and discovering that there actually is a great deal of information "out there." In particular, being aware of the Jewish immigration patterns and existing communities can provide great information that can tie your family back to their country of origin. The Jewish people have been moving steadily around the world since 586 BC. The Diaspora, which is Greek for "scattering," began when Jews were forced to move out of their Israelite kingdoms to Mesopotamia and other neighboring countries. Jews have experienced periods of peace only to be persecuted and forced out of their homes time and again. While Columbus set out to discover new lands in 1492, the Spanish government was forcing Jews to convert to Catholicism or leave the country. Some Jews converted and practiced their religion in secret, but most left the country and settled in Italy, Holland, and northern Africa. Unfortunately these Sephardic Jews (those from Spain and Portugal in the later Middle Ages) were unable to find peace in their newly acquired countries. Similarly the Ashkenazi Jews (from the Rhineland valley from Alsace and further north) were pushed further and further from their homeland. Many Jews were forced to live in poor, confining sections of towns known as ghettos. Word of the New World began to spread and with it the hope for a new life without the constant threat of anti-Semitism. In 1654, the first Jews came to America from Brazil and settled in New Amsterdam (now New York). From 1654 to 1825, the Sephardic and Ashkenazi Jews came to settle in Newport, Rhode Island; Philadelphia, Pennsylvania; Charleston, South Carolina; and Savannah, Georgia. Since America was the home of people from all over the world, the Jews did not escape the prejudices of the past; many assimilated to avoid persecution. By 1825, the number of Jews was roughly 4500 in the United States, but the number of German Jews immigrating was on a steady increase. Cincinnati, Ohio experienced a large growth of these people and became a center for Reform Judaism in America. These Jews created communities in small towns of the Midwest, West, and South. Though land was plentiful in the Ohio Valley, the Jews were unaccustomed to the ways of farming and chose to settle in populated areas. 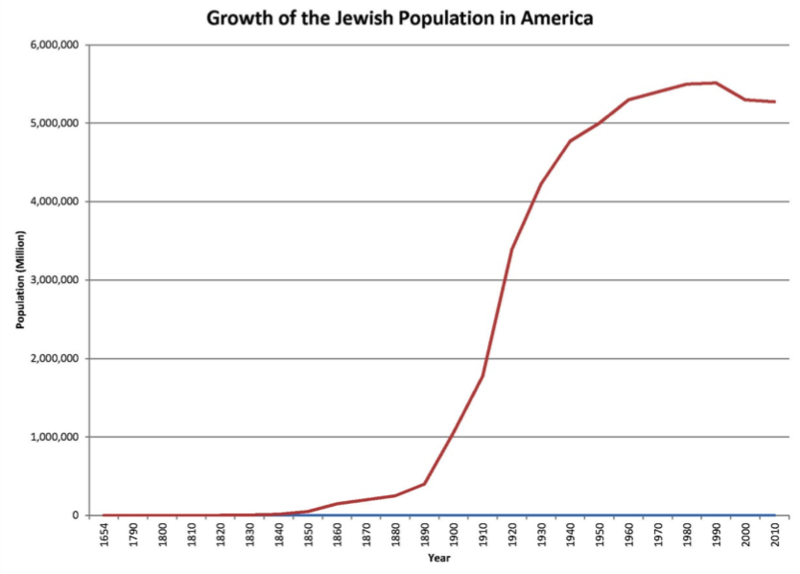 By 1924, immigration limitations were in place and the Jewish population increased at a more moderate rate until 1945. During this time, many Jews settled in Canada and waited to be admitted to America legally. The quotas for German citizens wanting to immigrate to the United States was 27,370 in 1939, and 300,000 German refugees had applied for US visas in 1938. America was trying to recover from the Depression and did not want to take on new residents that would be a "burden" on the system. As a result, Jews were forced to stay in Europe and had little opportunity to escape the terrible regime of Hitler and the Nazis. During World War II, the Jews experienced a terrible loss of their people and until late in 1942, the reports of the murder of millions were not believed to be true. Fortunately, the War Refugee Board took aggressive action to rescue the Jews and is credited with saving close to 200,000 during the final months of the war. Holocaust survivors were allowed to immigrate to America thanks to the Displaced Persons Act of 1948 which allowed 200,000 Jews to enter. In the 1960s the Jewish population increased with Israelis, Cubans, and Near Easterners immigrating. Most recently, the Jewish immigrants have been primarily Israeli and from the Soviet Union. There are 13.3 million Jews in the world; 6.5 million of them are in North America. Presently some of the largest Jewish communities in the United States include New York City, Boston, Philadelphia, Los Angeles, southern Florida, Washington DC, San Francisco and Chicago. The Jews faced a unique challenge after a life of persecution and moving to a strange new world with many different people, languages, and customs. Once the Jews settled in a community they often looked for others who shared their religious views and would start or join a synagogue. They started schools to teach the children Hebrew as well as secular subjects. The Jews went into business, opened factories, or if they were well educated were able to enter a profession. They learned crafts such as watchmaking, tailoring, shoemaking and carpentry. Many Jews began to serve as peddlers taking goods to the pioneers living to the west. As their numbers increased they found that they felt compelled to help others coming to America. Soon, societies and lodges were formed. In 1843, the society B'nai B'rith was formed with the intent of mutual aid for its members. Other organizations such as the Anti-Defamation League, the Hillel Foundation and the Hebrew Immigrant Aid Society were formed. Landsmanschaften were small societies based on their ancestral town. All of these groups can provide resources for researching your Jewish ancestors. Each immigrant left behind traces of their lives that are just waiting for researchers to unearth. Ship records, society membership, synagogue documents, school research, city directories, guilds and unions, business and tax records could all be potential resources for learning more about the lives of the Jews. Any one of these may include clues about your ancestor's beginnings; it just takes looking down a new road. The Economist. "Mapping Judaism." 23 February 2013. http://www.economist.com/blogs/graphicdetail/2012/07/daily-chart-16: 2012. "History of the Jews in the United States." Wikipedia, 9 February 2013. http://en.wikipedia.org/wiki/History_of_the_Jews_in_the_United_States: 2013. Krasner-Khait, Barbara. Discovering Your Jewish Ancestors. North Salt Lake: Heritage Quest, 2001. Kurzweil, Arthur. From Generation to Generation: How to Trace Your Jewish Genealogy and Family History. San Francisco: Jossey-Bass, 2004. Mandell L. Berman Institute- North American Jewish Data Bank. Jewish Population in the United States, 2011. Report: Storrs, Connecticut: JDB, 2011. Pessen, Deborah. History of the Jews in America. New York: The United Synagogue of America, 1957. United States Holocaust Memorial Museum. "Displaced Persons." 28 February 2013. http://www.ushmm.org/wlc/en/article.php?ModuleId=10005462: 2012.